New PJs - There is nothing better than new PJs especially as we are spending Christmas Day at home this year, there's no rush so we probably stay in our pjs and open presents until late morning. Hot chocolate cocktail - A bit of Netflix and chill (literally) with a boozy all the trimmings hot chocolate cocktail. If hot chocolate is not your thing then what about a nice bottle of red wine? Fudge & Posh crisps - Errr need I say more, some (more) lovely late night treats so we don't have to get up and march all the way into kitchen...which is actually right next door to our living room! But who wants to move when you are all snuggled up in comfy new PJs and drinking a hot chocolate cocktail. Candles - Candles are a huge part of our Christmas tradition, so a fresh new candle is a must. Over the weekend Toby Carvery challenged me to take a day off from cooking at home, not much of a challenge really and I can't say I took much convincing! A day off from preparing, cooking and then clearing said food off of the floor, where do I sign?! We went to our local Toby Carvery on Saturday which was perfect timing as we had a particularly manic but lovely day planned. Our day started bright and early by decorating our Christmas tree, a spot of Christmas shopping then to the cinema to watch The Good Dinosaur. Our table at Toby Carvery was booked at 5.30pm straight after the film finished but a little later than the little lads would eat dinner normally. I couldn't resist piling my plate high! I chose pork and beef, a HUGE Yorkshire pudding, stuffing, roast potatoes, plenty of veg and lashings of gravy, the whole shebang!. Everything you would expect from a good Sunday roast but without the effort of making it yourself. The little lads actually prefer meat and potatoes over chicken nuggets and chips so they were happy chappies with their roast. We were stuffed after our main but we could have gone up for more potatoes and veg if we wanted but myself and the little lads had our hearts set on desert. For desert the little lads both chose orange jelly which had segments of oranges inside (one of their five a day! Mum -2 Little Lads 0) I had the biggest black currant Eton mess, it was lovely but I couldn't finish it, Tiger was more than happy to assist me. The Mister was so full after his main he could only manage an espresso. We had an lovely meal, in a cosy Christmassy restaurant which was really family friendly. What I was surprised about was how affordable our family meal was, we ordered 2x adult Carvery mains, 2x children's Carvery mains, 2x orange jelly deserts, an Eton mess dessert, 2x apple juices, a beer and a white wine Spritzer (well it was a mums night off after all) and an espresso and it totaled to £41.80 which I feel is very reasonable for a family meal out. Thanks Toby Carvery, I thoroughly enjoyed your challenge. 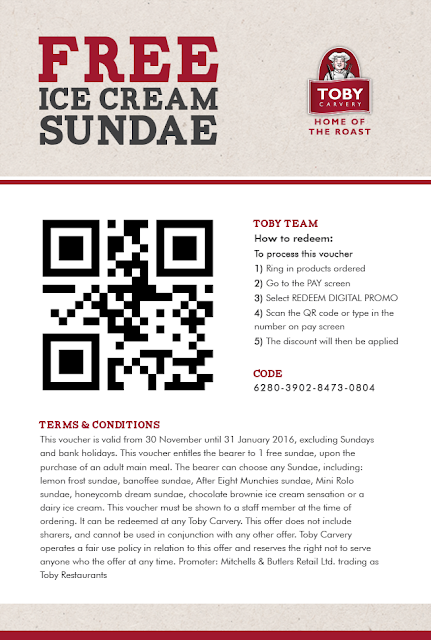 Toby Carvery are offering all of my readers a free Sundae see full details below. Yesterday morning we were invited to have breakfast with Santa at Wyevale Garden Centre in Sherfield on Loddon. The little lads were so excited to be meeting the big man himself and excited to be having breakfast out as we very rarely do. I love visiting Wyedale Garden Centres at this time of the year, it always has such a Christmassy feel with all the freshly cut Christmas trees, Christmassy flowers and gorgeous decorations. This is usually where we come and let the little lads choose their new decoration for our Christmas tree, it's become a bit of a tradition now. But actually having breakfast and meeting Santa was an extra special treat that we've been looking forward to. When we arrived, we were shown to our table. The 'colour me placemat' were set out for each of the little lads along with crayons, chocolate coins and Christmas crackers. We were told to make ourselves comfy and help ourselves to tea, coffee and squash. At the time of booking we chose to have a full cooked breakfast (bacon, fried eggs, a sausage, fried bread, black pudding, hash browns, beans, mushroom and a tomato!!) we didn't need lunch after eating all of that! And the little lads had a children's cooked breakfast (sausage, a hash brown, beans, scrambled eggs and toast) all of which was lovely. Once the breakfast was cleared away the elves who were beautifully dressed and very friendly bought over Christmas tree cookies for the little lads to decorate. They definitely went for the 'more is more' approach and piled theirs high with icing and sweets. They were delighted with their cookie creations. While we were busy decorating the cookies the elves told all of the children to sit on the mat by the grotto, they needed to tell them that Santa had gotten lost and that they needed to shout and call out for him. After some VERY loud shouting, Santa appeared with a huge sack. Santas costume was great and he was fantastic with the children. After he had said his hellos and given a few high fives we were asked to continue with decorating our cookies so each child could meet Santa individually, have their photo taken with him and receive their gift. This is the first year both of the little lads were excited to meet Santa with no tears. They had their photos taken, had a little chat with Santa and received their gifts. It was all very sweet and probably the first time that I began to feel all Christmassy this year, there's nothing like seeing Christmas through the eyes of your children. They really enjoyed it and soaked in the whole experience. 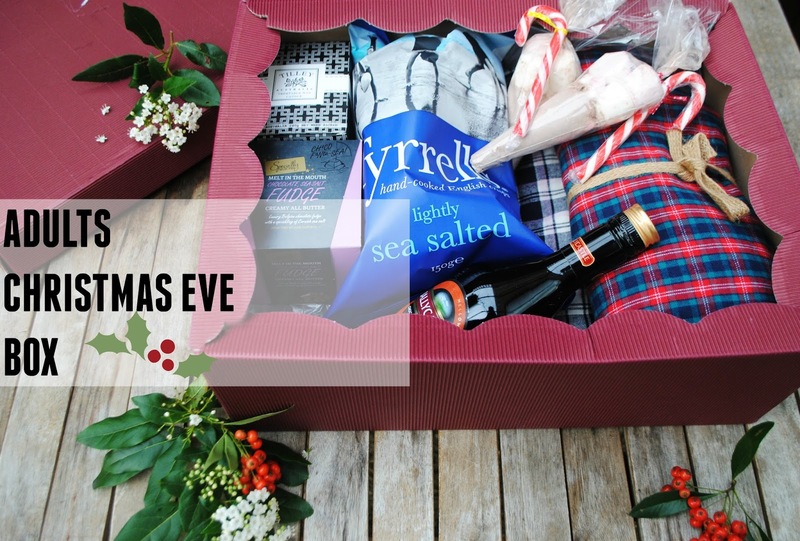 I was really impressed with the gifts from Santa, beautiful wrapped in big boxes, which as we all know, it's size what matters when it comes to presents! Tiger received a board game which we played until we waved Santa off and were ready to leave. Beaux received a stunt racing track which we opened once we got home and both little lads played with all afternoon! We had a fantastic morning and left feeling really Christmassy. It was perfect way to meet Santa this Christmas. I highly recommend it, we will be coming again next year. To book your visit click HERE. Disclaimer: We were given complimentary tickets for the purpose of this review, as always all opinions and photography are my own.